Having been in the tour and activity space for almost eight years now, we at TrekkSoft are very much aware of our tour booking software competitors - who they are, what they're good at, what they're not so good at. 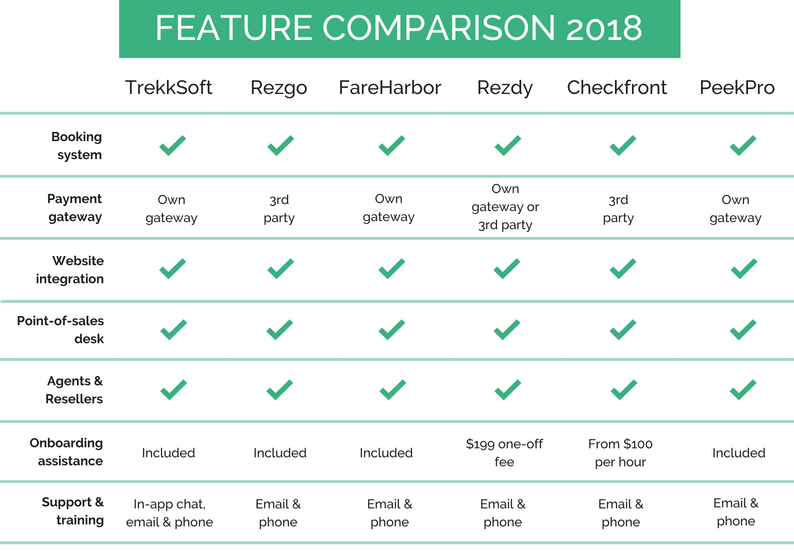 So we thought we'd share some of that insight with you, comparing tour booking systems against Rezgo, Peek, Fareharbour, Rezdy and Checkfront. As a whole, players in the niche tour, activity and rental sector offer fantastic customer support. Go on any software review site like GetApp or Capterra and you'll find customers singing praises about the support they've received at various stages of their businesses. Another thing I'd like to point out, and that I'm particularly proud of is that while the sector might be small, competition is fierce. TrekkSoft and our competitors innovate quickly. Everyday, there are announcements of new partnerships, acquisitions, features releases and more. We do this to keep up with demands and simultaneously strive to forge a new path for tour and activity operators around the world. Now, let's take a closer look at a few of our competitors in the tour and activity software space. Get our handy PDF to compare TrekkSoft, Rezdy, Rezgo, Checkfront and more. Established in 2010, TrekkSoft was founded in Interlaken by Jon Fauver, Valentin Binnendijk, and Philippe Willi. Jon contributed his background of 20+ years in the industry, while Valentin and Philippe brought to the table their experience as entrepreneurs, founders, and board members. In 2017, Olan O'Sullivan stepped up as CEO. Over the years, our innovations have led us to partner with major brands in the industry including TripAdvisor Experiences (previously known as Viator) and Hotelbeds Group (also known as Transfers & Activities Bank). We are also proud to be used by big tour companies like SANDEMANs New Europe (Europe's largest free walking tour provider) Bus2Alps (Europe's #1 student tour operator) and Fjord Norway (the official tourist board for Western Norway). Pros: We offer a comprehensive suite of online and offline tools to connect your front and back offices. For companies focused on building partnerships, our system connects you with other local and international operators, travel agents, resellers and marketplaces. Pricing: We revamped our subscription plans and you can now get our most popular features from as low as €50 a month. Rezgo was co-founded by Stephen Joyce who is also the acting CEO of the company. Launched in 2007, they were one of the first companies to offer booking management solutions in the tour and activity sector. In this respect, we tip our hats to them. Pros: Good software solution with a built-in waiver system that allows you to sync bookings with customer records and waivers. Cons: Channel manager only connects with two major marketplaces - Expedia and Viator. Pricing: While Rezgo doesn't charge you a fixed booking fee, they charge a 5% transaction fee for online bookings and 1% for offline bookings. An additional credit card fee is charged based on your chosen payment method. Peek joined the travel tech space in 2012 with a consumer facing marketplace Peek.com as well as Peek Professional, a B2B booking software. Founded by Ruzwana Bashir and Oskar Bruening, the company raised $10 million in July 2016 to "continue to bring the best tour operators onto the platform" as reported by Tech Crunch. In April 2017, Peek and Zozi have "come together" with Peek acquiring a portion of Zozi's assets and employees. Representatives of the companies say that the Zozi brand, both their B2C marketplace and their B2B booking solution, will be phased out and Zozi's customers will be migrated to Peek Pro's solution. This year, Peek secured another round of funding, raising $23 million in June. Alongside this announcement, they also announced their partnership between Google and Peek, which will allow Peek to display their inventory on Google Maps, Google Search and Google Trips. They have a similar partnership with Yelp. 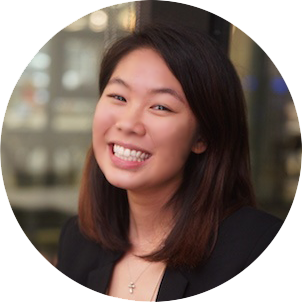 Pros: With the increased cash flow, PeekPro has been able to grow their supplier solution rapidly, focusing on optimising the booking and checkout process. Cons: PeekPro does not offer sophisticated solutions for companies who want to connect their booking systems with resellers, booking agents and other local partners. Pricing: For online bookings, they charge a 6% "convenience fee" to your customers, plus a credit card fee of 2.3% plus $0.30 to suppliers. For offline bookings, no booking fees are incurred but the credit card fee applies if a credit card is used. one time set-up fee of $199. Family-run company FareHarbor started in 2013 with founders Lawrence and Zach Hester. The company caters specifically to smaller businesses and has been successful at targeting this niche. In April 2018, FareHarbor was acquired by Booking Holdings for an undisclosed amount. This move by Booking Holdings clearly signals consumer demand for tours and activities on a global scale. However, there's uncertainty about the independence and integrity of a software provider that's been acquired by a large conglomerate. Pros: Pay as you go model allows customers full access to all their features, perfect for customers who want to try out the software with no strings attached. Cons: While they offer a great solution for new and small businesses, the FareHarbor system lacks the ability to handle more complex requirements for larger companies. For example, they do not have an integration with Zapier (which is fairly standard for most booking systems) and they do not offer the ability to bundle multiple products into one package. Pricing: Similar to PeekPro, they charge your customers a 6% "convenience fee" plus a credit card fee that varies depending on where your customers are based. Hailing from Australia, Rezdy secured $1.8 million in funding to expand business into America. The company started in 2011 and was co-founded by CEO Simon Lenoir and CTO Hugo Sterin. Rezdy offers two types of solutions: one for tour and activity operators, and another for resellers like travel agents and booking agents. Both accounts have access to Rezdy's internal marketplace, allowing companies to upload their inventory to be resold, or to resell inventory from other suppliers. In the last few months, Rezdy introduced their Channel Manager as an Add-on for new subscribers, charging an additional $59 per month for customers who want to connect to resellers and major marketplaces. Pros: They offer a really good solution for tour and activity companies of all sizes. Cons: As they are based in Australia, it's not clear if they can properly support European operators given the diversity of the supplier market in this region. Pricing: Rezdy recently introduced their new "Advantage" plan that's commission based, similar to PeekPro and Rezgo. A myriad of online, offline and agent booking fees apply to this plan. They have other subscription plans as well, starting from $89 per month. From Canada, founders Jason Morehouse and Grant Jurgeneit started the company in June 2010. Like the rest of us in the tour and activity software space, they too were frustrated at the lack of tools available for operators to deliver a professional experience online, which is why they started Checkfront. The company's website also features their adorable dogs Rogue and Kona. The thing I admire most about Checkfront is the quality of products they ship. It's consistently well designed and optimised for users who are not incredibly tech savvy. Their built-in waiver and website builder are great examples of this. Pros: Their booking system is incredibly well designed and integrates with over 50 3rd party applications like Constant Contact, Salesforce and Xero. 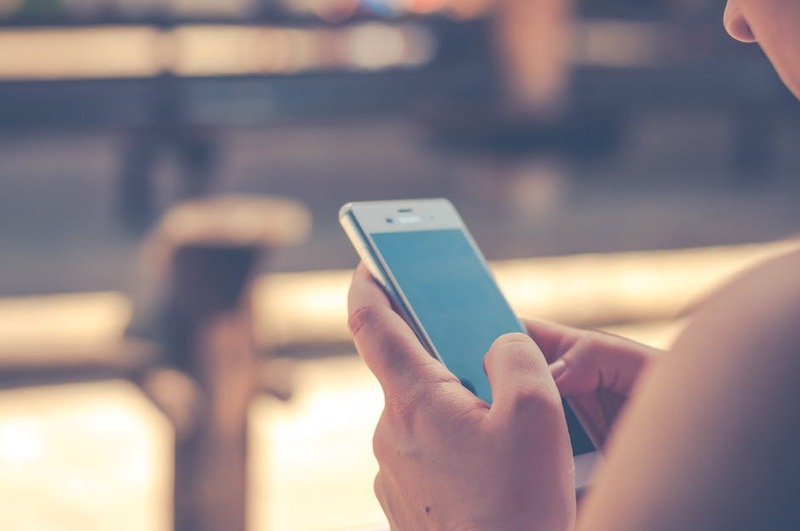 Cons: Unlike other booking systems mentioned in this post, Checkfront doesn't offer it's own payment solution meaning that operators will have to seek out a separate solution and integrate it with the booking solution. Furthermore, Checkfront still lacks high-level solutions like a resource manager that allows suppliers to limit their availabilities according to the resource they have. Pricing: Checkfront operates on a monthly subscription model, with the lowest plan starting at $49 a month. For operators who need more help after onboarding, they can sign up for a training call that starts from $100 per hour. When it comes to TrekkSoft, we want to provide our customers with the tools they need to connect with their customers, to each other, and to their resellers or booking agents. We believe that we are the ideal one-stop-shop for tour and activity operators who have a wide range of offerings and want to streamline their bookings and manage it better. With a track record of serving customers in 134 countries in 7 languages, we're confident that we can provide you with the solutions you need to grow your tour or activity company. 1. List down all the reasons why you need a booking and management software. 2. List down some non-negotiable. What are some sign-up terms you absolutely will not agree to or features you absolutely need? Perhaps you don't want to pay more than $199 a month, or you absolutely require a software that comes with a rental feature because you run a kayak rental company. Eliminate companies who don't fit this bill. The list I've provided can be used as a starting point. There are a tonne of other companies out there and many more appearing each day. Narrow your results down to 3 - 5 softwares. Many companies will offer a free trial period where you can explore the backend of the software, or offer a live demo where a team member walks you through the different features available. This is also the time where you should raise any concerns, ask as many questions as possible and even attempt at negotiating for a better rate. Not sure what questions to ask? Here are 20 questions.